WASHINGTON (December 14, 2015) – In a major victory for the pro-life movement and for the Republican congressional leadership, the U.S. Senate has for the first time passed a bill that would block most federal funding to Planned Parenthood. The same bill would repeal major components of Obamacare, including the provision that provides federal tax subsidies to health plans that cover elective abortion. Following months of intense activity by National Right to Life, the Senate on December 3 approved H.R. 3762, known as the “budget reconciliation bill,” by a close vote of 52-47. The roll call on final passage was largely along party lines, with all but two Republicans voting to pass the bill, and every Democrat voting against passage. The Senate’s December 3 action followed initial approval of the reconciliation bill in the U.S. House of Representatives on October 23 by a vote of 240-189, with only one Democrat supporting the bill, and only seven Republicans opposing it. A “budget reconciliation bill” is a bill considered under special fast-track procedures. Such a bill is not subject to filibuster in the Senate, so it can be approved there by a simple majority vote. However, complex rules limit what types of subjects can be addressed in a reconciliation bill, and these rules differ somewhat between the House and Senate. The House-passed bill contained language to block most federal funding to Planned Parenthood for one year, and to repeal some aspects of Obamacare. The Senate, operating under its distinct rules, approved a version that retained the language to defund Planned Parenthood, while adding provisions to repeal additional provisions of Obamacare in two years. Among the provisions added was a repeal of the Obamacare program that currently provides federal tax subsidies to help millions of Americans purchase health plans that cover elective abortions, in states that have not passed specific laws to prevent this. This is the first time that the Senate has passed legislation to repeal this program, which constitutes the single greatest abortion-expanding component of Obamacare. Because of the changes that the Senate made to the reconciliation bill, it must still receive final approval in the House, which is expected to occur when Congress returns from its holiday recess in early January. President Obama has expressed strong opposition to both the Planned Parenthood and Obamacare aspects of the bill, and has vowed to veto the measure. “While this bill faces the implacable opposition of President Barack Obama, the Senate’s action has constructed a legislative roadway that can be traveled to victory in the future – once we have a pro-life president,” said NRLC Legislative Director Douglas Johnson. The bill is the latest chapter in a long-running effort by pro-life forces to curb federal funding for the Planned Parenthood Federation of America, which provides roughly 40% of the nation’s abortions. The organization receives approximately $450 million annually from various federal programs, by far the largest portion of this through the Medicaid program. Long-running controversy about this federal funding heated up last summer with the release of investigative undercover videos by the Center for Medical Progress. In some videos, various Planned Parenthood officials discussed selling baby body parts to firms that in turn market such parts to medical researchers. In other videos, doctors associated with Planned Parenthood and others discussed changing abortion methods to preserve intact organs for harvesting and other disturbing subjects. In response, several congressional committees launched probes into Planned Parenthood’s operations. More recently, the House created the Special Investigatory Panel on Infant Lives, a 14-member committee that will investigate various aspects of the abortion industry, including trafficking in body parts, and release a report and recommendations in 2016. The Senate Judiciary Committee is continuing its own investigation. There were also renewed attempts during the summer and fall to move legislation to block federal funding for Planned Parenthood. The House passed such a bill in mid-September, but in the Senate an attempt to move similar legislation fell six votes short of the 60-vote supermajority required to take up the legislation in the face of a filibuster by Democratic senators. Some conservative lawmakers and advocacy groups then insisted that the Planned Parenthood issue must be tied to a government-wide appropriations bill, but most mainstream pro-life groups, including National Right to Life, saw this as a dead-end strategy that would predictably lead to a “shutdown” of the federal government, give President Obama the political high ground while causing grave political harm to many pro-life lawmakers, and deflect public attention away from the substance of the Planned Parenthood issue. “National Right to Life and Susan B. Anthony List didn’t want to risk taking the focus off of the Planned Parenthood sting videos . . .by embroiling Washington in a battle over government funding,” observed Politico in a story published December 3. With the strong support of National Right to Life, the House and Senate Republican leadership instead crafted an alternative plan to embed an anti-Planned Parenthood provision in the filibuster-proof budget reconciliation bill. Disregarding skeptical commentary by the advocacy group Heritage Action and some radio-talk hosts, congressional staff succeeded in crafting artful language that covered Medicaid and most other major sources of federal funds to Planned Parenthood. NRLC analysts estimated that the language, if enacted into law, would block about $400 million of the approximately $450 million that Planned Parenthood is expected to receive through Medicaid and certain other federal programs in the next year, or about 89% of total federal funding. The amounts denied to Planned Parenthood would be reallocated to community health centers. Despite continuing objections from a few conservative quarters, the bill passed the House 240-189, with only seven Republicans opposing it (two of whom were against curbing funding to Planned Parenthood, and five of whom had other reservations about the bill). The only House Democrat to support the bill was Rep. Collin Peterson (Mn.). 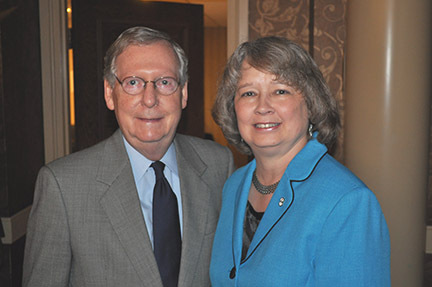 In the Senate, where Republicans control by a narrow 54-46 majority, Republican Leader Mitch McConnell (R-Ky.), a strong pro-life advocate, faced the challenge of passing the measure with no Democratic support, and at least three Republican senators opposed to cutting off funds to Planned Parenthood. Some other Republican senators expressed concerns as to whether the bill could be reshaped to reach various provisions of Obamacare that they considered particularly objectionable. However, in a letter sent to senators on November 17, National Right to Life said, “The pro-life vote is to pass the bill, for the sake of the defunding of Planned Parenthood — no excuses!” In a story that day, Politico reported, “That means Republicans would risk their National Right to Life score — a vital statistic to conservatives — by opposing the legislation for any reason. Among the other organizations that actively worked to push the bill through the Senate were the Susan B. Anthony List and the Family Research Council. Ultimately, McConnell steered the bill through an amendment process that preserved the Planned Parenthood cutoff, while expanding the anti-Obamacare provisions. This produced a final bill that was acceptable to all except two Republicans, Susan Collins (Maine) and Mark Kirk (Il. ), both of whom support funding of Planned Parenthood. Among the senators supporting the bill were all of the Republican presidential contenders who serve in the Senate: Marco Rubio (Fla.), Rand Paul (Ky.), Lindsey Graham (S.C.), and Ted Cruz (Texas). No Senate Democrat supported passage of the bill. During Senate consideration of the bill, pro-abortion senators twice offered amendments to protect Planned Parenthood – both of which were rejected. The first such amendment was offered by Sen. Patty Murray (D-Wa.). It would have stricken the provision to de-fund Planned Parenthood, and replaced it with language authorizing $1,000,000,000 (one billion dollars) in new funding, over a ten-year period, for which only organizations that provide elective abortions would be eligible. The new fund would be used to provide medical services (not excluding abortion) or “security” measures. The Murray Amendment was tabled (killed) by a vote of 54-46. Despite its radical character, only one Democrat voted against the Murray Amendment – Sen. Joe Manchin (WV). Only one Republican supported the Murray Amendment – Sen. Mark Kirk (Il.). After that, Republican Senator Susan Collins (Maine) – who had voted against the Murray Amendment – offered an amendment to simply strike the provision to defund Planned Parenthood. She was joined by fellow Republicans Lisa Murkowski (Ak.) and Kirk. In addition, every Democrat except Manchin voted for the Collins Amendment, which failed by a narrow margin, 48-52. Following votes on other amendments dealing primarily with Obamacare provisions, the amended bill was approved on the 52-47 vote, along party lines except for the negative votes of Collins and Kirk.